In fact, what if your coop is not even CLOSE to being done and your birds need to get outside, like yesterday? Even after planning a beautiful coop for my first four chickens, I had to buy a temporary tractor coop off of craigslist to buy us time to finish it. So we still blew the budget and fell behind schedule! By the time we had our birds into the newly-built coop, they were already laying. At this point, I found I hadn’t planned well in other ways, too… and we had issues with the new coop. It wasn’t easy to clean, for example, and the nesting boxes were inconvenient for egg gathering. Over time, we added on and modified our coop repeatedly to try to fix these problems. That’s more money and more time. Then we started to build a new one because we needed even more room. It was assembled using whatever we had laying around, with the idea that it would be budget friendly. That didn’t work out well because my predator proofing left much to be desired. It was too easily accessible to a local raccoon, and we had a tragedy. In the end, nearly 10 years later, my husband bought me the chicken barn of my dreams… which we’d probably paid for three times over, what with all the work and money we put into the first coops. And they never lived up to how well this barn works for us and the chickens. If we knew then what we know now, we’d have simply saved for the chicken barn first, and added chickens later! We need a new coop! Size matters. Start planning the coop for the number of chickens you want, but give yourself wiggle room. In other words, if you want to raise 4 chickens, don’t plan on getting a coop that can hold ONLY 4 chickens. Unless this is a hard set rule by your town, you’re probably going to want to expand your flock over time. Giving yourself extra space early on will save you from paying to expand the coop to just add some later. The space is already there. This gets you out in front of the dreaded chicken math that is to come! And if you don’t end up adding any chickens, your flock will be able to enjoy the extra space. Plan for delays. 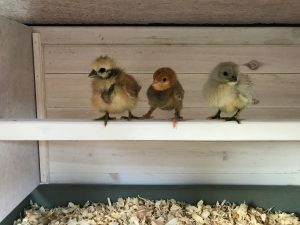 If you’re going to build a coop, start it when you make the decision to get chickens, even if you haven’t ordered your birds, yet. This gives you time to handle setbacks. For instance, if bad weather causes delays, you won’t feel rushed. You can still have time to make sure you do a good job. 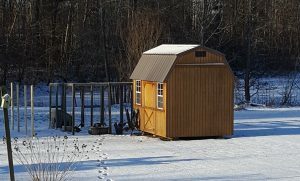 Get your coop plans now, and calculate the build time and costs way ahead of time. Some of our plans have costs and build time already factored for you. Coops need roost space for every bird. Chickens need a place to sleep, so make sure the roost/s offer plenty of space for the number of chickens the coop holds. I’ve seen a coop claim to house six chickens when its roost only provided enough space for three. Most chickens need 11″-12″ roost space each to sleep. Nest boxes don’t come with all coops. Some coops come with, and some don’t! You’ll have to buy or build nest boxes if your purchased coop didn’t come with them, or if it doesn’t provide a nesting space. Getting a cheaper coop isn’t saving if you have to keep spending to get everything in it you need. But that said, you only need one nest box (or one nest space) for every 3-4 birds. Don’t waste space by putting in 4 nest boxes for 4 chickens. They’ll share. Also check the size of the next boxes. If the nests were designed for bantams, a brahma or other large breed would never fit inside to lay. You’ve got to clean this thing! Coops with good access for you are important. Does it have a clean out tray you can slide in? Does it have wide doors so you call pull everything out for a good deep clean now and then, or will you be thrusting your arm into a space you can’t access well? Can you walk inside your coop comfortably to work your cleaning magic? There are lots of options; just make sure you’ve considered the nitty gritty of coop cleaning. Ventilation. This is super important, but often overlooked. Airflow helps keep odors down, and it keeps ammonia from building up in the coop and making it hard for your birds to get fresh air. It also helps keep a nice cross breeze during the heat of summer. In other words, ventilation is essential to healthy birds. But it is a balancing act: you also don’t want too much ventilation, where water and cold, icy air can get in, either. Your coop’s finish. You might think this consideration is more aesthetic than anything, but it’s not. You want your coop to last. That tractor coop I had wasn’t bad, but the exterior was treated wood with no additional finish. No stains, or paints. I didn’t have the foresight to refinish it or do anything special to it, and in just 2 years all the wood siding had rotted through. It had absorbed water as it was sitting on the ground. If I’d water sealed it on day one, and then once a year afterward, this wouldn’t have been an issue. So remember that outside wooden coops will eventually rot or warp without care. Find out what kind of care your coop will need and consider the effort and budget to maintain your paint, stain, or seal. Don’t want to bother with that? 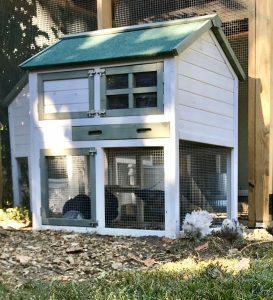 Consider some of My Pet Chicken’s fiberglass and plastic coops. Those often cost a little more up front, but you won’t have to spend the extra time and money to keep the wood healthy and strong. Predator protection. Yes, consider predator protection, even in urban or suburban areas! Many things want to eat your chickens. It’s not only wild animals like raccoons, opossums, coyote, and bobcat. It can also be your neighbor’s dog—or your own! So make sure your chickens are secure. Don’t use chicken wire for predator proofing, for example. Chicken wire is twisted and braided and it unwinds easily; predators can get through with very little effort. Try something with welded wire such as hardwire cloth. The lower the gauge of the wire, the higher the pressure it can take without coming apart. Or if you purchase a coop, pay attention to how secure it REALLY is. Coops like our clubhouse coop, for instance, have wire flooring options for added protection. An apron fence with buried wire helps keep the digging critters out of the coop and run. Another thing to check with a purchased coop is to make sure all doors have strong latches. You even want a secure latch on your pull-out cleaning tray, because raccoons WILL open those and pull out birds, or parts of them (! ), at night. Chicken Run. If you free range, what’s your Plan B for when your birds can’t get out of the coop and wander the property? If you go on vacation, will you have someone to be your bird sitter, or would you prefer to have a small secure area that they can roam for a week before you get back? Alternatively, what if you have a predator like a fox or dog stalking your yard? Do you want to have a secure place where your birds can forage until problems are dealt with? Even if it’s a small fenced area for temporary use, it’s still important to think about. At least look into the cost of a secure run, so you’ll know what to expect if you decide to add later. Emergency Back Up. What happens if you have a sick or hurt bird? Maybe you end up with a broody hen who wants to hatch babies? Or perhaps you’ve raised more chicks, but for a couple of months, they’ll be too small to go in the coop with all the big girls. I’d suggest a backup pen or coop. Some people call it a grow out pen, a quarantine space, or a hospital coop. There are lots of good reasons to have a small, second coop. It can be small, inexpensive and easy to move. Something like the townhouse coop might be perfect for this use. As you can see there are a number of things you can come to regret later. Coops are such an important part of keeping chickens it should be our first thought, well before we decide on what breeds we want to keep. Keep this check list with you while you are shopping for a coop, or determining what coop plans to buy. It’ll help you to remember all the major points. Your coop should be with you as long as you keep chickens! 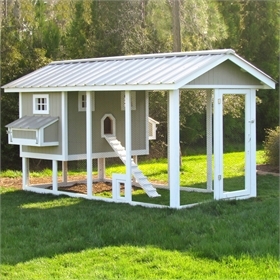 Do you already have a coop for your birds? Is there anything you wish you’d known before you started your journey? « Bring Your Chicken to Work Day!